The End of the Developmental State? brings together leading scholars of development to assess the current status of the "developmental state" in several developing and transitional economies of South Korea, Taiwan, Ireland, the United Kingdom, China, South Africa, Brazil and India. Has the concept of the developmental state become outmoded? These authors would suggest not. However, they do argue that the historical trajectories of developmental states in Asia, Latin America, Africa and Europe suggest all too clearly that the concept must be re-examined critically and creatively. The range and diversity of their positions and their rejection of stale programmatic positions from the past will revitalize the debate on the role of the state in social and economic transformation in the twenty-first century. 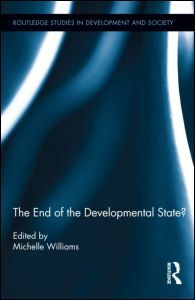 By bringing together careful comparative analyses of national cases, in both the Global North and South, the volume highlights pivotal conditions – economic restructuring, domestic politics, epistemic shifts and ecological limits – that are forcing revision of the goals and strategies of developmental states and suggests that states that ignore these new conditions will indeed see the "end of the developmental state".